The clinical case report describes the treatment of a class 4 (Heithersay classification) external invasive cervical resorption in the left maxillary lateral incisor. A 17-year-old female patient began an orthodontic treatment in a private practice a year ago. During maintenance consultations, the patient complained to the orthodontist of an increased sensitivity to cold stimulus in the left maxillary lateral incisor [Figure 1]a. The orthodontist observed a slight mobility in this tooth and the radiographic examination found a radiolucent area in the cervical portion of the lateral incisor root. With the likely diagnosis of an internal resorption, the patient was referred to an endodontist for evaluation. During the clinical examination, the endodontist found that the mesial gingival papilla was slightly swollen and that the tooth was mobile. During the thermal sensitivity test, the patient reported pain symptoms to severe cold which persisted after the removal of the stimulus. There was sensitivity to percussion and a radiographic area of thickening of the apical ligament which could be attributed to the application of orthodontic forces. However, there was no tenderness. The same radiograph demonstrated an area of bone rarefaction at the mesial bone crest, but the periodontal probing did not show probing depth or gingival bleeding [Figure 1]b. Although the image suggests an internal resorption, clinically, there was only a slight edema in the adjacent proximal periodontium and sensibility pulp to the cold test which would involve an external resorption. As the pain persisted, an endodontic therapy was indicated as an emergency procedure. Because there was a marked structural loss in the tooth in the resorption lacunae and an endodontic access would cause more weakening, the best option was to install a bonded retainer at the level of cingulum with an orthodontic wire (0.7 mm in diameter) fixed in the adjacent teeth with composite resin (Four Seasons, Ivoclar Vivadent, Schaan, Liechtenstein). Thus, the removal of the pulp tissue was performed only with the use of small-diameter endodontic files with sodium hypochlorite (2.5%). An intra-canal medication with calcium hydroxide was introduced that would not produce artifacts in a cone beam computerized tomography (CBCT) image as one was needed to determine the extent of the resorption cavity and the treatment. The diagnosis was confirmed on the CBCT image [Figure 1]c,d. In the axial slices we could observe the entry points of the granulomatous tissue which were located in the mesial region at the bone crest. There was no communication with the root canal. The canal was not obvious because it was filled with calcium hydroxide medication. In fact, it was observed that there was an overflow of the medication in the resorptive defect. The transversal image helped to make the clinical classification of invasive cervical resorption class 4 (Heithersay classification). Although, there was no communication with the root canal, the invasive resorption process was extending into the cervical and middle third of the root. Since there was no communication between the resorption lacunae and the root canal as evidenced by the confinement of the medication to the intra-canal areas, the endodontic treatment was performed without increasing the root canal because it was already large and in need of a predominantly chemical preparation. The endodontic therapy was performed in two sessions, with an interval of two weeks, using a paste of calcium hydroxide as the intra-canal medication (Callen PMCC, SSWhite, Rio de Janeiro, Brasil) [Figure 1]e. After this period, it was carried a canal filling using gutta-percha and sealers (Endofill, Dentsply Maillefer, Rio de Janeiro, Brasil) with lateral condensation. At the following session, the restorative procedure was performed by placing a fiber-glass intra-canal retainer (White Post DC, FGM Produtos Odontológicos, Joinville, Brasil) [Figure 1]f. The restoration was carried out with a light-cured composite resin (Four Seasons, Ivoclar Vivadent, Schaan, Liechtenstein). The root canal therapy and tooth restoration were performed prior to repairing the external resorption defect because the proximity of the canal and the extensive loss of tooth structure could cause complications in periodontal surgery including dental fractures in the area. After restoration, the next step in the treatment was the exposure of the resorptive defect through periodontal surgery. Initially, the local anesthesia was administered in the maxillary region and intrasulcular incisions were made on the buccal and palatal regions involving the adjacent lateral incisor. The mucoperiosteal flaps were spread which allowed the visualization of the entry point of the granulomatous tissue located in the cervical third of the root in its mesial aspect [Figure 1]g.
As recommended by some authors, , the debridement of the resorptive defect was performed with a sonic instrument (Sonic Borden 2000N, KaVo Dental GmgH, Warthausen, Germany). The probing of the resorption lacunae showed hardened walls and the knife-edge cavity-shaped physical characteristics of invasive cervical resorption [Figure 1]h. Then we decided to restore the cavity with the restorative glass ionomer cement (Merion, Voco GmbH, Cuxhaven, Germany) because the location of the resorption was supra and subgingival. We used a centrix syringe (Centrix Inc., Shelton, Connecticut, EUA) to inject the cement. The objective was to fill the gap in the defect through a small hole in the access cavity [Figure 1]i. After the cavity was sealed, the gingival flap could be repositioned and sutured. The patient was instructed on oral hygiene practices including mouthwash twice a day with chlorhexidine solution 0.12% and was prescribed antibiotic therapy with amoxicillin 500 mg and potassium clavulanate combined, twice a day, for seven days. One week after the surgery, the suture was removed and the lesion was controlled. After 19 months, the tooth remained asymptomatic and clinically showed a normal periodontal probing depth without any recession [Figure 1]j,k. In the X-ray, we observed some radio-density showing a remodeling of the mesial bone crest [Figure 1]l. There was no tooth mobility. Patients exposed to situations that can damage the support for the periodontal tissue such as orthodontic treatment in this case need to have careful periodic clinical examinations including X-rays. , Heithersay  found that orthodontic treatment alone was a predisposing factor in 24.1% of teeth with EICR. Invasive cervical resorption is difficult to diagnose and it is even more challenging to identify the extent and nature of the process, especially in cases where the resorptive defect is buccal or palatine in location. With conventional radiographic images, there are limitations that not only prevent the proper identification of the resorptive process, but also hinder the planning and the evaluation of the prognosis with a treatment. Cone beam computerized tomography is imperative to reveal the extent of the defect in the differential diagnosis between internal and external resorption, especially whether the resorption lacuna is located above or below the bone and whether there is surgical access. All of these factors are relevant in the prognosis after treatment. The images of the cone beam CT should include tangent (M / D), axial (more than 3 levels) and transverse (V/L) visualizations. In this case, the radiographic image suggested a class 3 ICR while the cone beam tomography showed a class 4 ICR including the entry point of the granulation tissue in the axial view. The clinical classification of the external invasive cervical resorption proposed by Heithersay is effective for determining the appropriate treatment based on the extent of the resorptive defect. However, it is based on the radiographic image and it is tomography that reveals the true extent and severity of the injury. Patel and Dawood  report on a clinical case where the image of the scan revealed that the defect presented by the ICR was longer (class 4) than what was determined using a conventional radiographic image. Therefore, the case was not treated because the scan image prevented the patient from having to undergo an unnecessary exploratory surgery. Heithersay  advocated that the selection of the case must be done carefully to achieve a favorable prognosis and recommended only treating defects that were class 1 to 3. Although our case was class 4, the maintenance of the dental element would have been appropriate, because as a teenager, the patient would have had potential facial growth that would prohibit the option of dental implants. In addition, the tooth loss would generate psychological problems in the patient. The difficulty of the treatment was based on the possibility of periodontal aesthetic problems and the possibility of crown fracture. The solution was conservative periodontal surgery and placement of a post-core. The axial image in the cone beam CT showed the proximity of the resorption lacuna with the root canal and the loss of extensive tooth structure which could cause complications subsequent to the treatment. Even the physiological masticatory movements could become a trigger of tooth fracture. 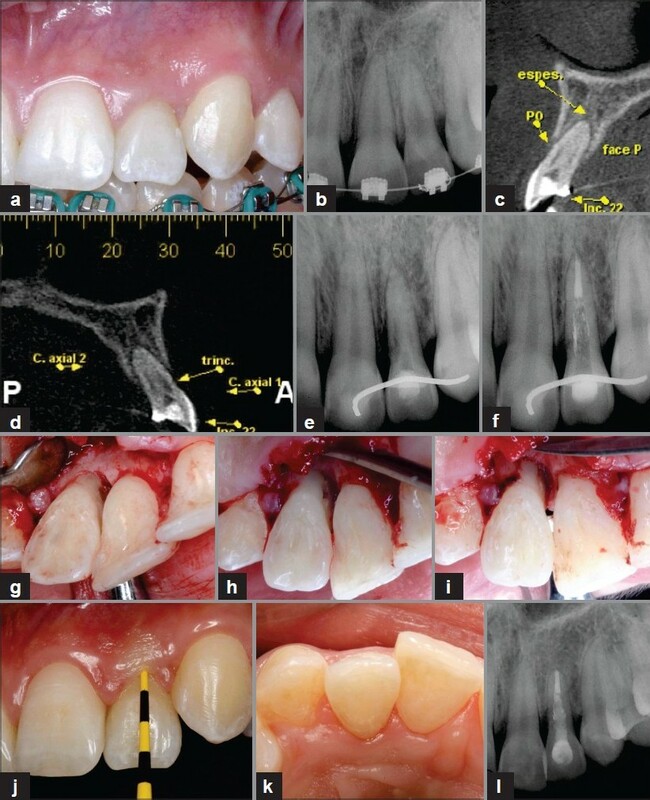 Based on all these considerations, the post-core technique was used to provide a transfixation of the dental crown to the root portion that was not compromised. The treatment of the external invasive cervical resorption of the lateral incisor interrupted the resorptive process and restored the damaged root surface and the dental functions without any esthetic sequelae. 1. Tronstad L. Root resorption: Etiology, terminology and clinical manifestations. Endod Dent Traumatol 1988;4:241-52. 2. Patel S, Kanagasingam S, Pitt Ford T. External cervical resorption: A review. J Endod 2009;35:616-25. 3. Fuss Z, Tsesis I, Lin S. Root resorption: Diagnosis, classification and treatment choices based on stimulation factors. Dent Traumatol 2003;19:175-82. 4. Yilmaz HG, Kalender A, Cengiz E. Use of mineral trioxide aggregate in the treatment of invasive cervical resorption: A case report. J Endod 2010;36:160-3. 5. Heithersay GS. Invasive Cervical Resorption: an analysis of potential predisposing factors. Quintessence Int 1999;30:83-95. 6. Heithersay GS. Clinical, radiologic and histopathologic features of invasive cervical resorption. Quintessence Int 1999;30:27-37. 7. Heithersay GS. Invasive cervical resorption. Endod Topics 2004;7:73-92. 8. Baek SH, Plenk H, Kim S. Periapical tissue responses and cementum regeneration with amalgam, SuperEBA and MTA as root-end filling materials. J Endod 2005;31:444-9. 9. Hiremath H, Yakub SS, Metgud S, Bhagwat SV, Kulkarni S. Invasive cervical resorption: A case report. J Endod 2007;33:999-1003. 10. White C Jr, Bryant N. Combined therapy of mineral trioxide aggregate and guided tissue regeneration in the treatment of external root resorption and an associated osseous defect. J Periodontol 2002;73:1517-21. 11. Smidt A, Nuni E, Keinan D. Invasive cervical resorption: treatment rationale with an interdisciplinary approach. J Endod 2007;33:1383-7. 12. Andreasen JO, Andreasen FM. Textbook and color atlas of traumatic injuries to the teeth. 3 th ed. Copenhagen: Munksgaard; 1994. 13. Patel S, Dawood A. The use of cone beam computed tomography in the management of external cervical resorption lesions. Int Endod J 2007;40:818-30. 14. Ferrari M, Vichi A, Garcia-Godoy F. Clinical evaluation of fiber-reinforced epoxy resin posts and cast post and core. Am J Dent 2000;13:61-5. 15. Akkayan B, Gülmez T. Resistance to fracture endodontically treated teeth restored with different post systems. J Prosthet Dent 2002;87:431-7. 16. Clavijo VGR, Bandeca MC, Clavijo MB, Clavijo EMA, Itikawa GN, Andrade MF. Personalização do pino de fibra de vidro com resina composta - pino anatômico. Clin Int J Braz Dent 2009;5:384-96. 17. Duret B, Duret F, Reynaud M. Long-life physical property preservation and postendodontic rehabilitation with the composipost. Compend Contin Educ Dent Suppl 1996; 20:S50-6. Kazemipoor, M. and Tabrizizadeh, M. and Dastani, M. and Hakimian, R.